COLOR(S): Red, reddish brown, and brindle. The Cardigan Welsh Corgi is not as popular as their sibling, the Pembroke Welsh Corgi, but they make an excellent pet. They are even said to have slightly better temperaments than the Pembroke. Cardigans are loyal, affectionate and good with children. They are intelligent and easy to train but need a firm hand when it comes to nipping, as they are prone to do so due to their ancestry as herding dogs. Wary of strangers and possessive of their owner's property, they also make a good watch dog. Cardigan Welsh Corgis are easily distinguishable from the Pembroke with their wide and wider set ears, as well as their long tail. Pembroke's tails are docked completely, that is if they are even born with a tail. Cardigans reach one Welsh yard from nose tip to tail tip, which is why they are sometimes called "yard-long dogs". They have longer bodies than the Pembroke, and are much longer than they are tall. Their colors consist of red, sable, brindles, black, tricolor, and blue merle--which legend says came from fairies who brought the color in the night. They usually have white on them with an Irish pattern, but overbearing white is considered a severe fault. They are loving, intelligent, and are hard workers with their high quality obedience skills. They can often appear sprightly in character and are quite confident. Active and devoted, this little dog can be quite amusing in character and appearance at times. They get along with children and other pets, their sturdiness making them suitable companions for even large dogs. Cardigans are said to have the heart of a large dog in a dwarfed body, making them an ideal companion. Cardigan Welsh Corgis are active, obedient, intelligent and alert. They make good watch dogs, as well as good guard dogs. 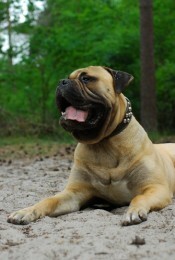 They can be possessive, and can be scrappy with other dogs. But with their friends and family they are playful, affectionate and loving. They may nip at the heels, trying to herd you or your children. They need strong training in avoiding nipping humans, and they learn quickly. They are fun loving, easygoing, and sprightly. Wary of strangers, they remain devoted to their owners and are usually good with kids. They can be amusing with their jaunty attitude. Welsh Corgis are little dogs with big hearts, hard working and affectionate. Brush the Cardigan Welsh Corgis coat twice a week with a firm bristle brush. Bathe only when necessary. Shedding is twice a year. Obesity, spinal problems, degenerative myelopathy (neurological disease known to cause lameness) and some inherited eye disorders such as PRA (Progressive Retinal Atrophy). Plenty of exercise at least twice a day as you do not want them to become obese and lazy. Cardigan Welsh Corgis love to have room to run around freely. Cardigan Welsh Corgi puppies are good listeners and are very attentive, making their training and upbringing easy. They are not difficult to train because of their high intelligence and quick learning ability. They should be socialized early on to avoid confrontation and suspiciousness with friendly animals and humans.